At the birth of the princess, when their majesties visited Paris, the queen did an act of benevolence which awakened the affection of the Parisians. And since we have few such anecdotes to give, it would be unjust to pass over this pleasing scene. The queen desired that a part of the money reserved for the public rejoicings, might be employed in marrying one hundred poor and virtuous girls with honest tradesmen; a choice was made from each parish. The future spouses formed two rows when their majesties passed the nave of the church of Notre Dame. The new married couples appeared uniformly dressed. The portion of each was five hundred livres; and the queen engaged to pay for the nursing of the first fruits of their marriages; and promised a greater benefit to those mothers who would suckle their own children: And the whole exhibition was crowned by the marriage of an honest couple, who had lived together above half a century, and who now renewed their vows of affection, which they had sworn, at so distant a period. This venerable pair was attended by all their children, grandchildren, and great grandchildren; they wore the same uniform as the younger ones, and they received the same portion. The marriages were celebrated before their majesties; and the scene melted the sympathetic Parisians into tears. It is curious to add that Mademoiselle Guimard, the queen of the theatre, resolved to give an entertainment at the Vauxhall, and to imitate her majesty in forming, in that public assembly, a marriage. Every one hastened to purchase a ticket; the benevolence was rendered doubly attractive by its frivolity. The portion was to consist not only of twenty-five louis by a contribution from the opera dancers, but also by the sale produced of the entertainment; of which the number of tickets sold amounted to 30,000 livres. 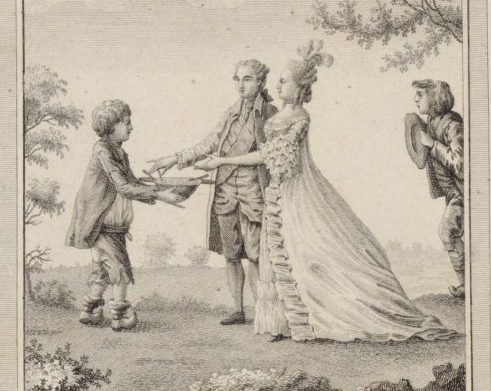 The rigorous archbishop of Paris, would not permit the celebration of this marriage at Vauxhall, pretending that it would be a public offence to decency and morals; and he procured in consequence an order from the court to hinder the celebration of the marriage in this temple of pleasure. Mademoiselle Guimard, however, would not lose the glory of this wedding; and it took place at her palace, which was always in a proper state to exhibit a festival. This is a curious instance of the levity of the nation, and the aspiring genius of Mademoiselle Guimard.